Ben Crawshaw at The Invisible Workshop has a couple of fabulous pics of the amazing Basque trainera, developed for anchovy fishing but now raced. There are 12 oars and steering oars in the stern and, unusually, in the bow as well. 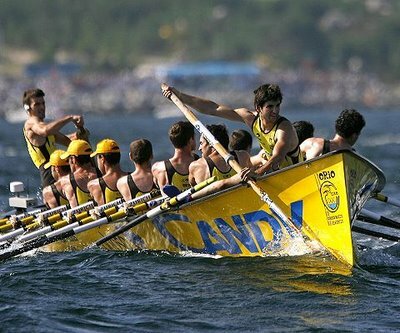 The bow man rows when not steering. Fire Captain Neil Calore is rowing from Washington DC to New York in the Voyage for Autism Awareness, using the Intra Coastal Waterway, rivers and canals and stopping at waterside Fire Service facilities. He is approaching Philadelphia - three cheers, Neil! I have been meaning to post this picture for some time. 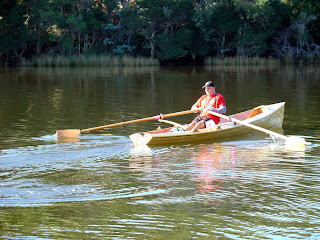 Drosso in Tasmania built this lovely strip plank coastal sculling boat in huon pine.